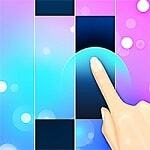 Play on the piano in Magic Tiles the present melody. Any incorrect pressing will immediately lead to a failure, therefore it is necessary to be extremely fast and exact. Compete and share with friends with the received achievements.